You have heard the term switchboard or PBX bandied around and figure your business probably needs one. But why and which one do you pick? Sit back, relax and keep reading for your complete one-stop source to figure out what switchboard will suit your business best. Whether you own a large company or a small office, you will need a switchboard system to connect all your employees and customers. As part of your company’s public image, making the correct decision about your switchboard can have a direct impact on your business’s bottom line. You’ll get to see all the top systems, prices, reviews and straightforward explanations of all the technical terms so you can empower yourself to make the right choice. In a rush? Jump to the top switchboards. As the first line of contact with your customers, the choice of switchboard systems will determine the first impression the customer gets of your company. Do your customers have to wait a long time before reaching a specific department? Does the auto attendant have your customers tearing their hair out? Do you have problems trying to communicate with another department in your company? All these problems exist in the networking world, and not just any switchboard system will do the job, but the right one will make your life much more comfortable. What is this switchboard going to do for me? Switchboards are crucial to scaling your business and making it look professional. A start-up can get away with using Skype, but once you want your company to graduate to the serious leagues, you will need a switchboard system. 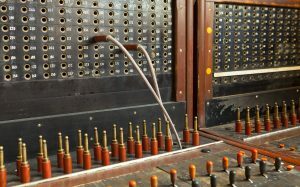 As well as connecting telephone lines together, you can get switchboards that offer a whole host of other features, which we will dive into below. The size and complexity of your business, as well as your budget, will determine what product is right for you. What exactly is a telephone switchboard? What is the difference between a PBX and VoIP? What else can a switchboard do? Who would use a switchboard? Telephones have existed for almost 200 years, and the technology behind them has changed how we live our lives. In 1894 the first switchboard was installed in Lexington, Massachusetts. It was a simple box that interconnected telephones, worked by an operator who would establish calls between each requestor. You probably have an old-timey image in your head of women in front of a big board of plugs and sockets, and this is precisely what they once were. Today the idea is still the same, but the method is entirely different. With the number of telephones increasing and means of communication expanding beyond just the bare phone, the switchboard had to change too. Today you will come across technology such as a PBX and VoIP that has replaced the manual method of connecting telephones. The telecommunications industry likes its jargon; we will try to avoid it as much as we can. But knowing the terms for what you do and don’t will help you find the best switchboard system for your office. Today, new switchboards are almost entirely automated. To understand the importance of the switchboard you need to know how the telephone network works and why switchboards are so important. First, no matter where you are, you will have a PSTN (Public Switch Telephone Network). This belongs to the telephone company in your area. The PSTN will establish Trunk lines to your building. It could be a house or an office, but the Trunk lines, or the physical cables, running to your building from the telephone poles outside your home are the responsibility of the telephone company or PSTN. On the outside of your building, there will be a box called the Demark Point. This is where the cables of the PSTN make the connection with the wires going into your building and connecting with your PBX (Private Branch Exchange) if you have one. It is essential to understand that everything outside of your walls from the cables on the telephone poles to the Demark Point on your wall is the responsibility of your PSTN. It is only the connections inside the property that you need to focus on, including your switchboard system. Here is a quick wrap-up of a PBX and VoIP. The PBX or the switchboard is an on-premises piece of technology in your building that interconnects your stations to each other. The term “station” is used because the PBX connects more than just telephones. It is capable of connecting many things, including intercoms in a warehouse, security surveillance systems, computers and of course telephones. These will be referred to as “stations” from here on out. Real-time voice exchange or analogue is the actual voice of the speaker going over the wires as sound waves and reaching the other end. This is seen in traditional telephones or fax machines. When a call is being placed, the PBX routes the call to the receiving number and then the call is established. A signal-based or Digital connection is when the voice of the speaker is broken up into ones and zeros and sent over a digital signal and then put back together on the receiving end, and the sound is heard. This is seen in smartphones, laptops and other modern technology that uses the Ethernet connection, such as VoIP. Now that you understand PBXs it’ll be easier to introduce the newer technology of VoIP. As the word describes, Voice over IP servers sends your voice over an Ethernet connection. This is done by a computer which sends data rather than transmitting your actual voice. This data is sent as packets, which are the smallest form of data. When you use VoIP, all your documents, photos, videos and even calls are carried over fibre optic cables and then put together on the receiving end. So what is so great about VoIP? Today almost all devices are cloud-based connections over the Ethernet as part of a Unified Communication (UC). UC integrates voice, video, data, messaging, conferencing, mobility, and more. With pure VoIP, you don’t have to own a server or an IP-PBX (sometimes called the Virtual PBX). You can rent the server from your PSTN and connect to their cloud service. In essence, the VoIP works and functions exactly like the PBX, but you rent the system from a provider instead of having the equipment sitting in your office. Eliminating PBX setup and maintenance costs. A cloud-based VoIP system could benefit your business if your customers want to use modern communication methods. By combining email, text, online chat as well as voice-based communications, customers can get in touch with you on their terms. If VoIP sounds like the right option for your company, then understanding the following terminology will help you to get the correct specification product for your needs. We will cover switches, data transfer speed, Quality of Service and VLAN. How does your VoIP digital switchboard connect to all your devices? Since all your communication devices are Ethernet-based and connected to your hosted server, the switchboard still plays the role of connecting your communication, but the scale is much smaller because it is all digital. The technology that makes these connections are called a switch, and they replace the PBX in your office. Unmanaged switches are 100% automatic. They have AI installed which give the switches the ability to identify which connection goes where. For example, if computer one wants to talk to computer two, the switch will learn which port computer two is plugged into. The same if computer three wants to communicate with computer two, the switch already knows which port is computer two. Calls, emails or any data can be communicated between the devices or stations in the system using unmanaged switches. All of the devices can talk to each other at the same time. And all this happens in the background, so you never need to worry about it. Managed switches can do a lot more than unmanaged switches. You can configure connection speed, traffic prioritisation (called Quality of Service or QoS), and control which stations can communicate with each other (VLAN). Some of these tools will be useful to you, while others may not. They will be described in a little more detail so you can select what you need. Being able to configure your connection speed helps you use the maximum data transfer rate that your devices need. The speed of the switch ranges from 10 megabits per second (Mbps) to 100 Mbps. For example, if device 1 runs on a 10 Mbps speed and is talking to device 2 with 100 Mbps speed, you can set the port of device 1 to use only 10 Mbps and device to use 100. This cannot be done on an unmanaged switch as the switch will decide on its own. Sometimes a 100 Mbps device will be recognised as a 10 Mbps device, and the speed will be set to only 10 Mbps making your device transmit data slowly. On the topic of speed, there are also trunk ports on each switch. These ports help connect switches, aiding traffic flow. This means if switch one has too much traffic, the data will be sent through the trunk port to switch two. These ports are often supported with fibre and therefore can transmit data up to 10 gigabits per second, helping your data move as efficiently as possible. This handy configuration is found in managed switches. QoS prioritises the packets of information travelling through the switch. For example, you can configure video conferences to be a high priority. If this is the setup, computer one and computer two, who are in a video conference, will be getting a higher speed compared to computer three which is downloading an email off the internet. Another feature similar to QOS is the Spanning Tree Protocol. This protocol finds the best and fastest way to transmit data packets. VLAN helps you configure which devices are allowed to communicate with each other. For example, you can configure your ports 1-4 to communicate with each other and ports 5-6 to be on their own. There is no possible way that the computer from port one can communicate with the printer or surveillance camera on port 5. This helps you to control the amount of communication going on within the switch. Even though they are plugged into the same switch, the VLAN will set up partitions and restrict communication. Smaller businesses can use unmanaged switches, and larger ones need the capabilities of a managed switch. You want your information sent and received as fast as possible, controlling speed through a managed switch can help you maximise the capabilities of your device. How does an incoming call reach an operator? What if the number is busy with another call? The PBX is programmed to search for an available number automatically. You can choose a program for where calls are directed. For example, if a customer is calling line number 1 and the line is busy, it will automatically connect to line number 2 if that is busy then line number 3 and so on. This is called an Automatic Call Distribution. This programming is set up with your PSTN and will automate the call to the next available number. However, this also means you need to consider how many lines (or trunks) you have that can carry calls into your business. If you have only one trunk line coming into your building and connecting to your PBX, then you can just have one ongoing call at any given moment with the world outside of your office. If you have two trunk lines than you can have two on-going calls at any given moment and so on. But the needed ratio drops as your numbers grow. If your office has 40 employees, then 4 to 5 trunk lines will be enough. All other calls will be routed to your IVR which will be explained in the next section. This can be an area where retailers can be unclear on what they will offer you, so it’s good to have an idea what you need. So what happens when all the lines are busy? What happens to your customer who is calling? Most people who own a PBX expect it to have an Interactive Voice Response (IVR). But in reality, your PBX may, or may not have an IVR function. The IVR contains the Voice Mail System and Auto-Attendant. These are vital functions to deal with calls when a person is not available. Customers can hear information about the business and wait time and leave a message. The IVR is accessed through ports, and there will be a limited number of these. No matter how many trunk lines you have run into your office, if you only have two ports for your Interactive Voice Response, then only two people (or subscribers as they helpfully call them in the IVR world) can have access. A third person contacting the IVR will hear silence, so it’s essential to set up enough ports on your IVR. You will also use IVR ports for routing calls to any remote employees who don’t have a physical desk in your office. If you have five employees in your office, then you will need at least one trunk line for incoming customer calls. If you have 40 employees working in remote locations, then you will need another 40 ports for the IVR, on top of what you require for incoming call overflow. An easy way to remember this is that trunk lines are for stations in your building. Ports are for your Interactive Voice Response and are for routing calls to your remote employees who don’t have a physical desk in your office. Now you have made it to the decision making part of this article; you are at the final steps before making your choice. The cost and fees of a switchboard system are determined by what you currently have set up in your office and whether or not you want an on-premises system or cloud-based system. Entry level PBXs can range from £73.10 to £590.00, and pro versions can reach up to £2000. Also you will need to purchase suitable handsets for each person in the office if you do not have these already. Handset costs range from £14 for starter models to £70 for middle ranged models. Prices can reach up to £360 for the high-end models with touch screens and video capabilities. You’ll have full control of your system and have the security of housing the system yourself. You can utilise both your traditional telephone systems and IP devices as PBX systems support both formats. Is the majority of your business conducted through calls? Is your business highly digital? Will you require a massive switchboard infrastructure? Then a hosted VoIP system may be the right choice for you, both regarding functionality and cost. Upgrades and maintenance service are provided by your telephone company. Save space in your office. The prices for these will range from £3.00 to £17.00 for entry level packages. You will need to invest in new handsets id you are changing from a traditional phone system. The in-depth pricing details are given in the next chapter, where the companies go head-to-head against each other. Now that you understand the how the telephony system works. You are fully equipped with an in-depth understanding of the components and know what specifications you are looking for when choosing a switchboard. Here are some top-ranking on-premises telephone switchboard systems that will suit your needs. Digium has more than 20 years of experience with business communications. 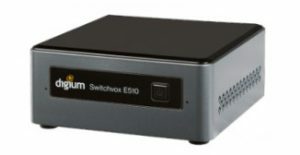 Their Digium Switchvox E510 is a small yet sufficiently powerful tool for any small business. Well priced, the Switchvox E510 has the scalability for any fast-growing business. The Grandstream UCM6202 will serve the communication needs of your business in a fast and user-friendly way. The UCM6202 IP PBX appliance comes with enterprise-grade video, voice, data and mobility as well as its user-friendly solutions. The Grandstream UCM6202 is built on the existing UCM6200 series, offering more features and functionalities. The Sangoma FreePBX Phone System 40 comes with a 1-year warranty and is a cost-effective and feature-rich solution for small business communications. 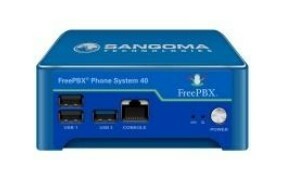 Sangoma FreePBX Phone System 40 has no problem supporting UC, IP trunking, and FreePBX and many other advanced VoIP features and applications. Xorcom Spark CXS1000 has the power any business is looking for at the price anyone can afford. Spark’s flexibility allows you to connect your IP Phones or line phones, whether it be analogue or digital devices, you have a full range of choosing what you need. Based on Complete PBX operating system, means it allows unlimited auto-attendant, voicemail to email and queues all with simple web-based management. Its professionalism and affordability all in one box. Not looking for an on-premises system? Here are some recommended cloud-based phone companies with their entry level packages for you to choose from. Hopefully, there is one in the pack that has the features that you are looking for. Need help picking a brand? Prices will range from £73.10 to £590.00 and these are just the entry-level ones!, The pro versions can reach up to £2000 and up to 400 users. If your business is focused more on calls then the Digium system is better for you. If you need more functions and you still use a mix of an analog system and a digital one (IDSN) then the Xorcom Spark would be the ideal choice. But what if you are ready to make the jump from on-premises to cloud-based? Then you will have to see what your business is in need of. For more video-based conference and high data usage then the Cisco company is well equipped for that purpose. But if you are a small business and you what to keep things looking professional but are on a tight budget, then the Mitel option will suffice for the basic needs to run a professional business. When starting out Skype might do the trick, but it is not what you want to use to represent your business in the longer term. If you have read this far, it is clear that you want a more professional method of handling your calls and other communications with your customers. Switchboards are perfect for business level companies who deal with customers on a regular basis. Whether it be a sales department, a call centre or a company that needs a strong internal telephone infrastructure. All business need communication solutions to handle the calls. What kind of level of communication will you need though? Well, that’s up to you on how you see your business and how much scalability you have and how much your telephone system can scale with you. Now it’s time to digest everything you have just read. You know your managed switches from your IVR ports, and you hopefully have a good idea which switchboard will best serve your business. Switchboards basically manage, route and establish calls and other communications within your company and with the outside world. The basic components that make up the system are your broadband, devices in your office and your PBX. You can choose an on-premises system (PBX) or a cloud-based system (VoIP). Choose an on-premises system if you deal with a variety of devices and still need both analog and digital. VoIP is the most modern technology and will be cheaper to set up and expand. If it suits your requirements, VoIP can be a professional way to run your business at a fraction of the price. It turns out switchboards aren’t as much of a mystery as you first thought! But regardless of the option you pick, either method will help your business look more professional to your customers. The final word is to make sure your telephone system serves you and can grow as your business expands.